So the other night, I decided this was silly, and that I would resolve it and find an automated way to deal with the problem. 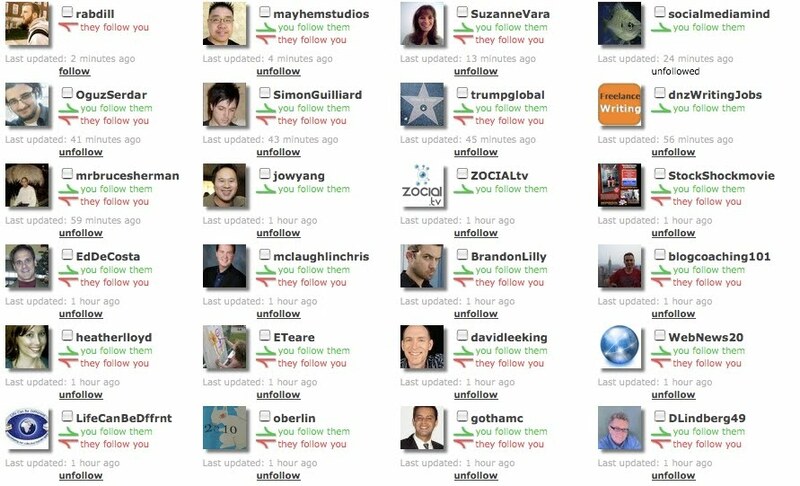 I needed to quickly and easily see all those I was following as well as my followers, in one easy screen. I considered some of the Twitter management tools I had already been using, but they didn't seem to fit the bill. 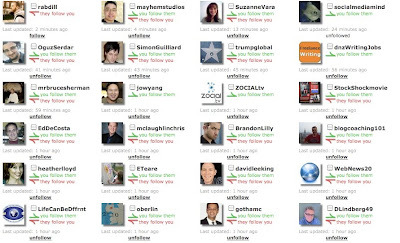 Using Hootsuite, which I had only dabbled in, I could not find any tool for managing followers. Again, I did a little research and found I had to install a Firefox Add-on. I have installed it, but not yet restarted Firefox, so I don't yet know if that resolved the issue. I had also been using Sendible, which I really liked for updating multiple accounts at once, as well as sheduling, but there was no Follower management tool I could find. So, that left me to further research, and when I found Twitter Karma, I knew I'd hit gold! All I did was type in my Twitter user name, set the time period for when updates were last made, (1 week, 3 weeks, 1 month),hit "Whack!" and in a few minutes, all my contacts popped up in one easy screen, that was color coded: green for folks I followed, and red for those who were following me. So, I could easily scan the screen and see who to delete. I needed to unfollow about 40 folks, so I chose the most obvious: those who had not followed me back, and/or those who had not updated their tweets in several weeks to a month. I updated my entire account in less then an hour, and now I am happily following new peeps! I will go back to Twitter Karma when I next have this problem, or when I want to get an easy, one-screen view of my account. NOTE: Twitter Karma recently deleted its BULK UNFOLLOW application, apparently as a request from Twitter, so you do have to manually click the follow or unfollow. But the easy layout of the screen makes this go a lot faster. Has anyone else discovered some good tools for managing their followers? Post here in the comments.